This Monday, September 18th, was National Rice Krispies Treat Day. 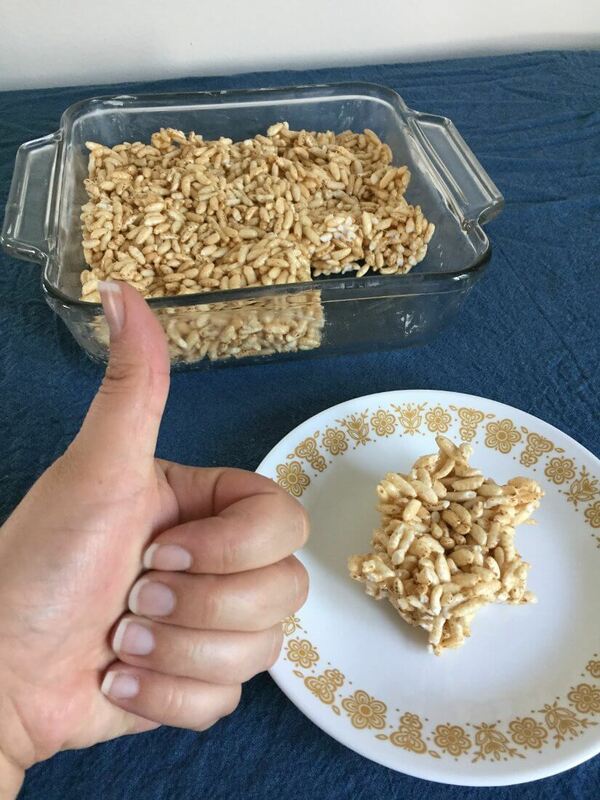 In celebration, employee Alex tried making “Healthy Rice Krispies Treats” from Heather Haynes at Kula Mama for this week’s Recipe of the Week. 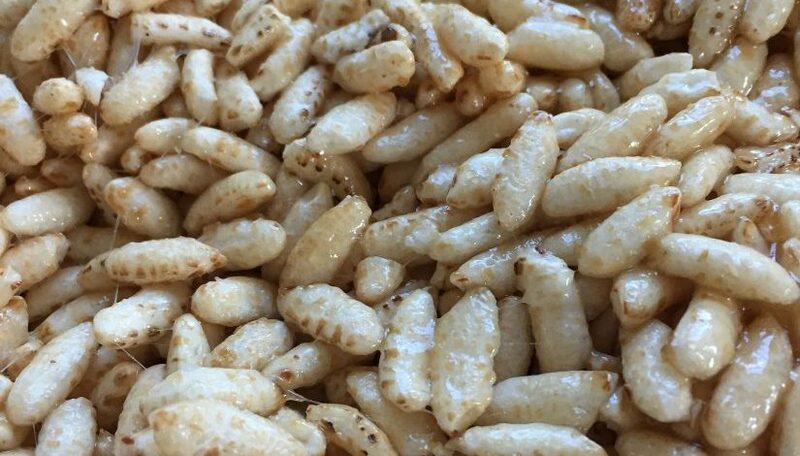 This simple recipe made the perfect afternoon sweet-tooth cure at the office. Check out the recipe here to give it a try on your own. Read on to see how it went for Alex! 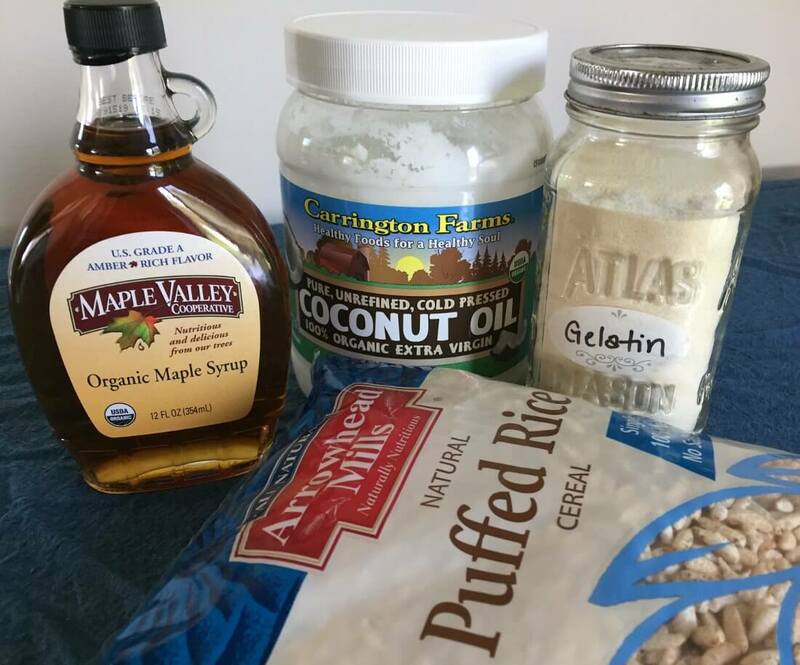 It was easy to prepare for this one as I only needed to gather Maple Syrup, Coconut Oil, Grass Fed Gelatin, and Puffed Rice. 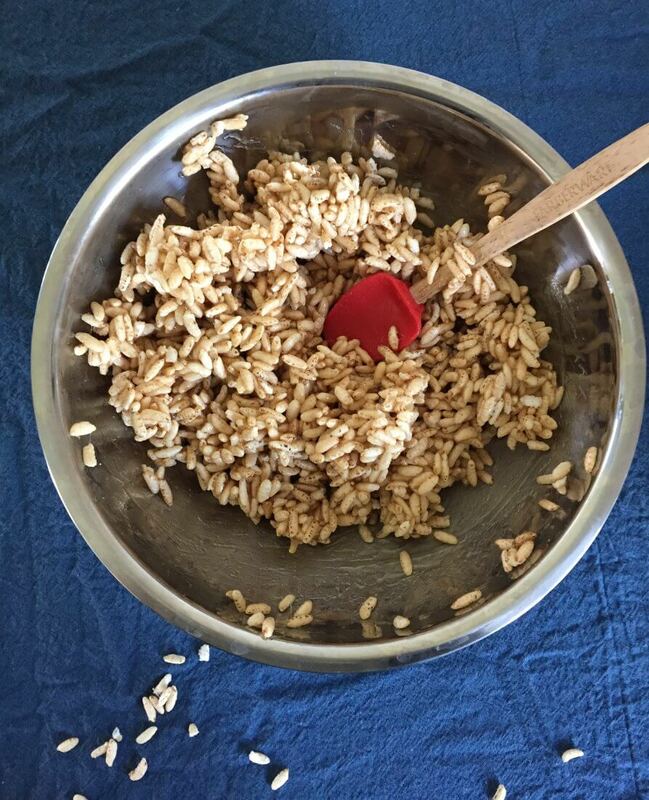 I already had everything but the puffed rice in my pantry. 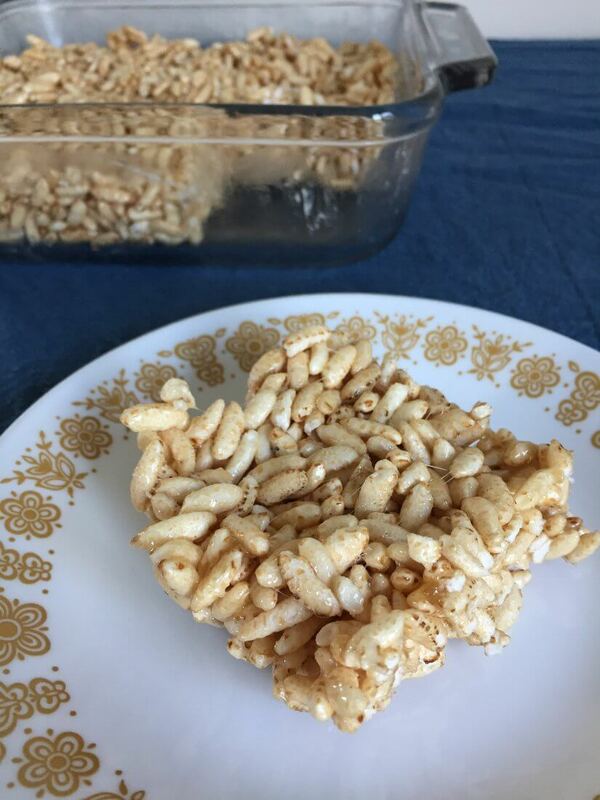 I decided to use amber syrup for this recipe to get more the classic, sweet, rice crispie treat flavor without an overpowering maple taste. To begin with, the recipe states to combine coconut oil and maple syrup in a small saucepan on the stove over low heat. It says to mix them until combined. No matter how hard I whisked, they would not fully combine. I finally just gave up and decided to move on to adding the gelatin. As soon as I added gelatin, the mixture started to bubble and boil. I was worried that I had the temperature too high, so I reduced the heat. Even at the lowest stove setting, the mixture still wanted to boil. I stirred vigorously. It was very difficult to keep the gelatin from clumping. I finally decided I wasn’t going to eliminate every clump and embraced chaos. 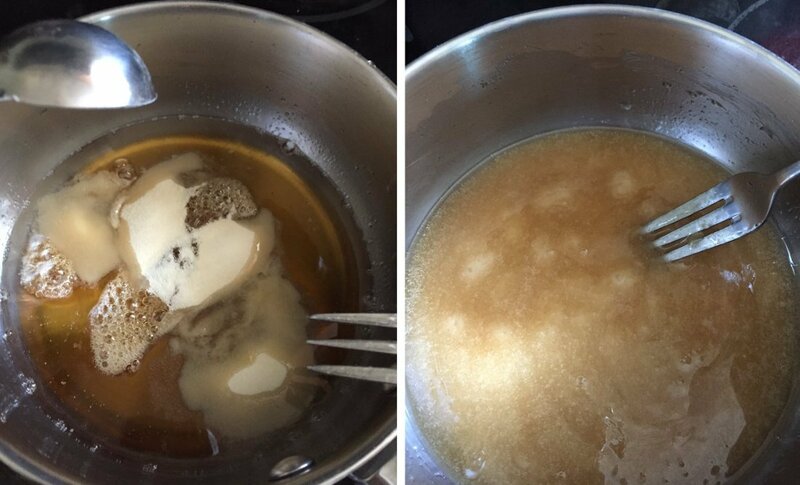 At this point, the mixture was quite thick and left a coating on everything it touched. I transferred the stove mixture to a bowl as the recipe instructs. 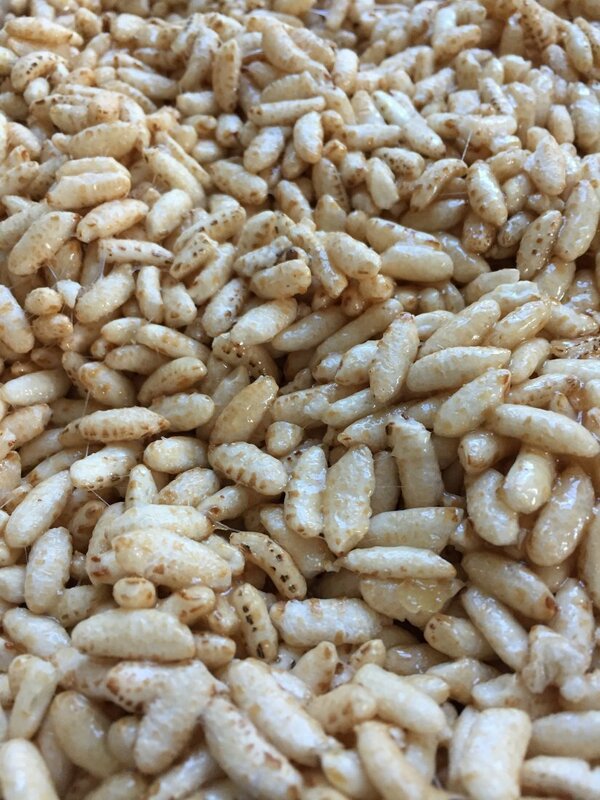 I then added my puffed rice and stirred it all together. As the rice got coated it became gooey and sticky. It looked delicious. I was amazed to find that I actually owned an 8×8 pan; the exact size the recipe calls for! I greased it with some organic butter and flattened it out as well as I could. Afterwards, I put it in the fridge for about 20 min. It didn’t look much different when I took it out of the fridge. I cut out a piece and gave it a try. When I took the first bite I thought to myself “this DOES taste healthy!” I could still taste all four of the individual ingredients. The combination was incredibly satisfying though, and my treat was gone before I knew it! It took a large amount of will-power not to have another. This one gets a thumbs up from me! All in all, I would say this one was a winner! How can you go wrong with easy, quick, healthy, and tasty? In the future I might get creative and try some flavored (lemon!) gelatin in the recipe. Did you give it a try? How did it go? Let us know in the comments below!